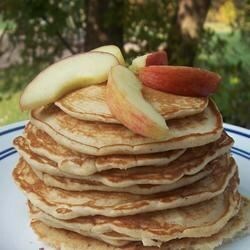 "Very moist and flavorful pancakes to warm any morning." In a large bowl, stir together the eggs, milk, yogurt and oil until well blended. Combine the flour, baking powder, baking soda, salt and cinnamon, stir into the milk mixture until smooth. Fold in chopped apple. Heat a lightly oiled griddle or frying pan over medium high heat. Pour or scoop the batter onto the griddle, using approximately 1/4 cup for each cake. Cook until bubbles form in the cakes and the bottoms are golden brown. Flip and cook the other side. Serve warm with syrup or jam. Banana bread becomes a pancake! This was the best pancake recipe I have made. The pancakes freeze well. I will make these often.